Oh Baby! Meet the 2015 Foals! Ruby was the most delicate foal, underweight and yet quite curious; she did her best to be a little warrior princess. It was apparent she did not understand her fate and was mourning her mother while fighting for her own life. No more than a week old with big brown eyes and a red dun coat, tussled from the nibbling of her other young companions, Ruby was an unlucky filly on a date with destiny. She did not ask to be born to an unwanted mare; she did not ask to become a feedlot orphan foal and she certainly did not ask to be discarded. Each year thousands of foals are born as bi-products of the pharmaceutical and nurse mare foal industry or to unwanted mares who find themselves hauled to the feedlots with their foals at foot. It is illegal to send a foal under 6 months of age to horse slaughter. In spite of the law, foals as young as one day old right up to the to six months guideline, are being skinned and sold for high-end leather. Others, who don’t meet this gruesome fate and are not rescued are sent to slaughterhouses. These foals have no chance at life from the start. Their meat is considered a delicacy in some countries. Horrifically, some countries actually believe that if a foal is skinned while it is still alive the meat will be tenderer. Recently, during a week-long event, at Friends of Horses Rescue in Colorado, Anna Twinney guided students and auditors through her exclusive foal gentling process. The group worked with recently rescued orphan foals in an effort to introduce them to first touch, halter, leading, loading, and lots more, in a non-stress, compassionate and effective way! The training they receive is priceless and a crucial step for these young horses getting adopted to the right forever homes and having that second chance at life. Ruby stood proud and embraced the gentling week holding no grudges, but instead accepting the very first human touch, haltering, leading, veterinary care, farrier prep and holistic health support. In the hands of rescuers she was found a surrogate mother, who due to the mourning of her own foal, was simply unable to accept her. Found rejected for the 2nd time in her life Ruby was adopted by Reach Out to Horses where she now embraces another chance to be surrounded by foals and horses who will teach her life naturally. “By gentling the foals and introducing them to humans it is our intention to make them better candidates for adoption. It is too easy to just throw these horses away like unwanted refuse. It is our hope to show the world just how valuable they are and help them find their way to new life,” Anna explains. Anna, an equine linguist, animal communicator and energy healer is no stranger to this process and works almost exclusively with rescues and animal sanctuaries all over the world. Her methodologies of what the mainstream would call “horse training” is actually the translation of the horse’s language “Equus” to something humans can understand. Reach Out to Horses was developed with the mission of bringing harmony to horses and humans. For more than a decade, ROTH has been instrumental in the rescue and re-homing of hundreds of horses. Nearly every ROTH event doubles as a fundraiser; hundreds of thousands of dollars have been raised for the care of the horses and the ongoing operation of the rescues with which they worked. Many of the foals from the gentling event were adopted and taken home by the students and auditors. A few are still seeking homes. To learn which foals are in need of homes please see the video below. Meet the orphaned foals gentled by ROTH students during our recent course on foals. Several babies are looking for homes! 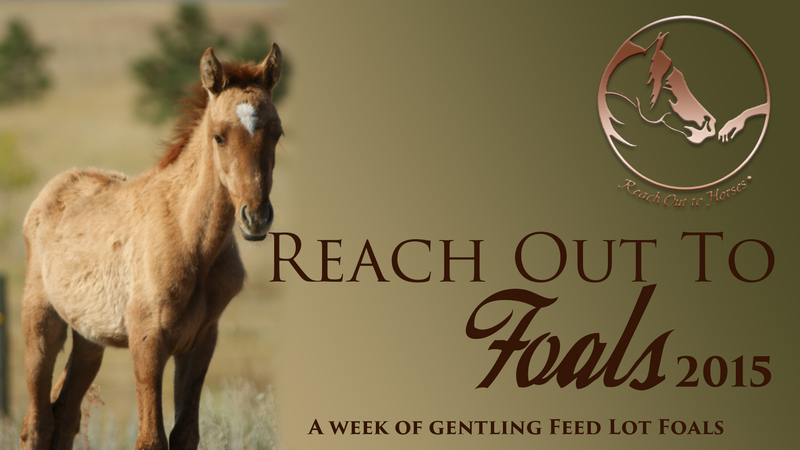 To learn more about Reach Out to Horses, upcoming events, courses or classes please visit ReachOutToHorses.com or email info@reachouttohorses.com. Previous postMeet the Mustangs 2015! Next postEqui-Spirit Horse Play Balls Featured on Emmy Award Winning TV Show on CBS October 10th!